That sure sums up the situation for many Americans, especially the Christian Zionists. The jewish press and the sitting US president would love for you to believe it was Palestinians (and not Israelis) dancing for joy when the towers came down in NYC on September 11th. They want the rightful owners of the land of “Israel” to be broad-brushed as Islamic terrorists. They want the Palestinians to be completely delegitimized and dehumanized. Israel stole the land of the indigenous Semites of Palestine and threw them all in a concentration camp; where they are routinely bombed, sometimes with illegal weapons (eg, white phosphorous); where they have their houses sprayed with “skunk spray”; where they have to go through countless checkpoints to get from one side to the other; where their water and electricity is rationed by Israeli as a form of punishment; where essential aid is not allowed in; where young children are kidnapped and indefinitely imprisoned without charges; and where innocent men, women and children are subject to sniper fire, without any repercussions… oh wait, according to the Israeli defense minister, none of the almost 2 million people living in Gaza are innocent. They are all born terrorists who do not deserve any rights. 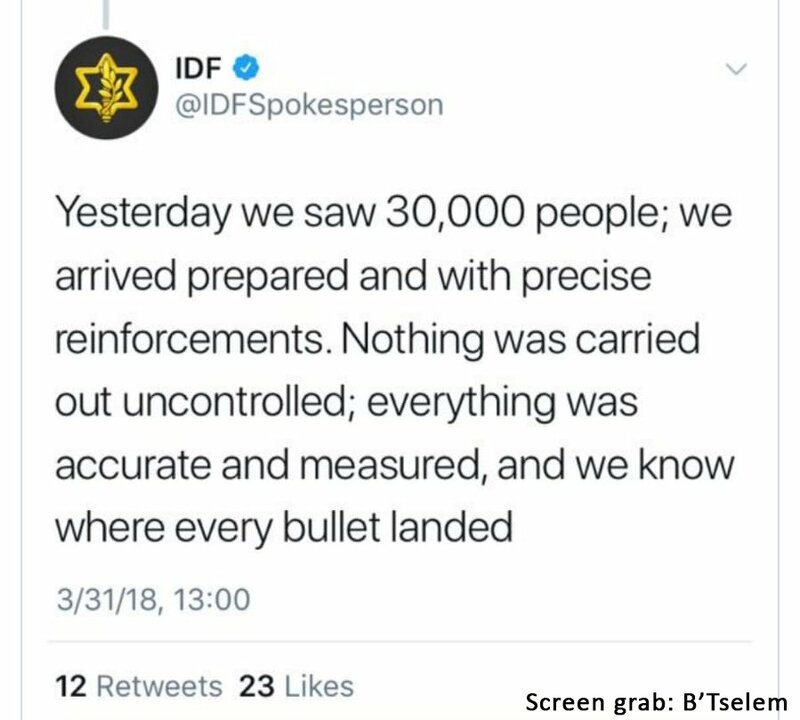 After the first massacre of unarmed Palestinians, Israeli Prime Minister Benjamin Netanyahu congratulated: “Well done to our soldiers”. Spokesman for the ruling Likud Party Eli Hazan told Israeli television that all 30,000 protesters – men, women and children – were “legitimate targets”. Israel has taken full responsibility for the murders, which they claim are justified. Donald Trump has not commented directly on what has been transpiring, but one would have to assume he is absolutely giddy at the slaughter being carried out by his buddy Bibi. So far over 30 unarmed protesters have been killed and thousands others injured on the Gaza border during the recent “March of Return” protests. The peaceful protesters have been subjected to tank fire, sniper fire, and tear gas from drones. The mainstream media in the US, which usually pretends to care about the oppression of brown people at the hands of violent racists, remains largely silent. They do not even seem too concerned that a press reporter at the protests was murdered by sniper fire. Sources in Gaza have confirmed that journalist Yaser Murtaja has died after being shot in the abdomen by an Israeli sniper while covering the protests. He was clearly wearing a vest that identified him as press. Rest in peace. The American people need to know what their tax dollars are funding. They also need to realized that American police forces have received Israeli training and the US Congress has been furiously crafting legislation to target “anti-Semitism” and any boycott or even criticism of Israel. As to the last paragraph above: Clearly the Jews run and control America. This has been true for a very long time, sorry to say.